The MSCI Emerging Markets index is created by Morgan Stanley Capital International (MSCI) designed to measure equity market performance in global emerging markets. 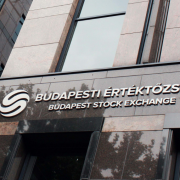 It is a float-adjusted market capitalization index that consists of indices in 23 emerging economies Brazil, Chile, China, Colombia, Czech Republic, Egypt, Greece, Hungary, India, Indonesia, Korea, Malaysia, Mexico, Peru, Philippines, Poland, Qatar, Russia, South Africa, Taiwan, Thailand, Turkey and United Arab Emirates. Initiated in 1988, the MSCI Emerging Markets Index (MSCI EMI) represented 10 nations with a total world market capitalization of less than 1%. In 2016, the index has since grown to incorporate 23 countries that comprise about 10% of global market cap. 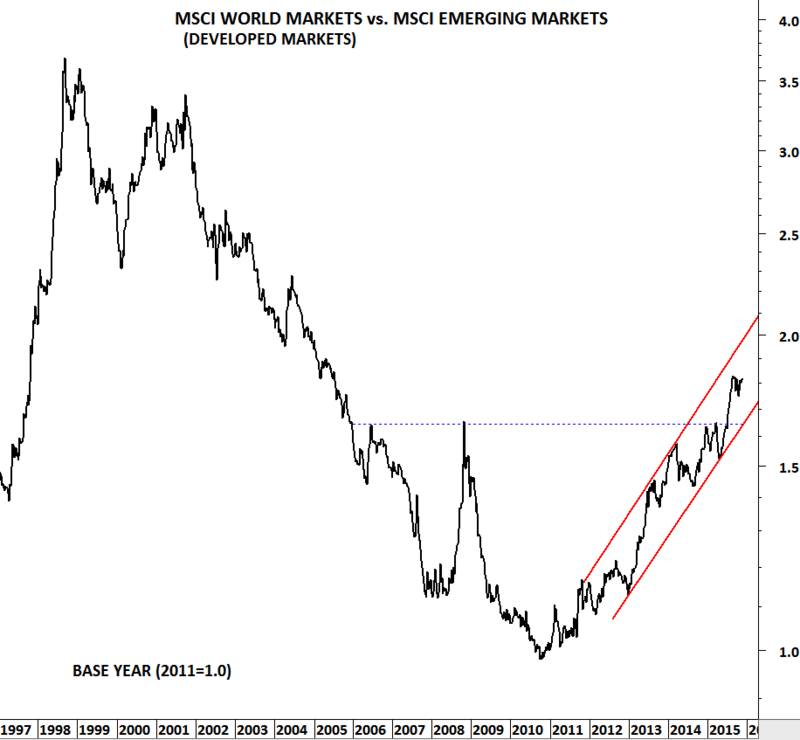 Hence, the MSCI EMI is appropriately used as a benchmark for performance by many emerging market growth mutual funds. 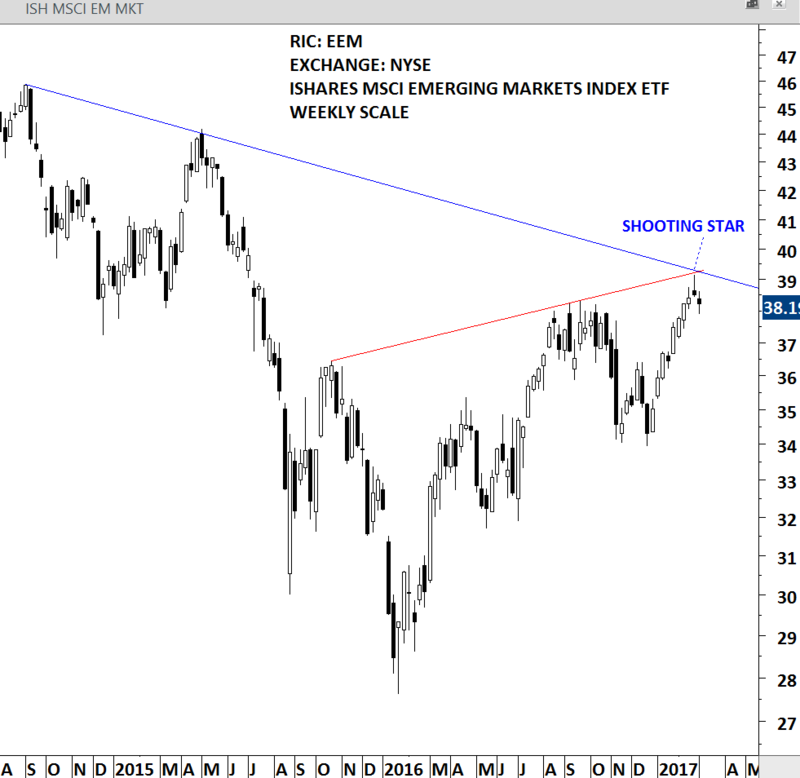 The iShares MSCI Emerging Markets ETF seeks to track the investment results of MSCI Emerging Markets Index. This ETF does not include any currency hedging. This means investors in this product gain exposure to the underlying securities and the currencies in which they are denominated. It is an efficient way to take advantage of trends in the emerging markets and cyclical movements related to emerging markets local currencies. Last week's update drew attention to the developing bearish candlestick reversal pattern, a shooting star, usually suggests lower prices following its completion. This week's lower opening and weak closing confirms the short-term pull-back in emerging markets equities. Compared to traditional bar charts, candlestick charts can be more helpful to analyze price action. We can see the relationship between the open and close as well as the high and low. The relationship between the open and close is considered vital information and forms the essence of candlesticks. This week's price action in global equity markets is worth analyzing with the help of candlestick chart patterns. Doji are important candlesticks that provide information on their own and as components of in a number of important patterns. 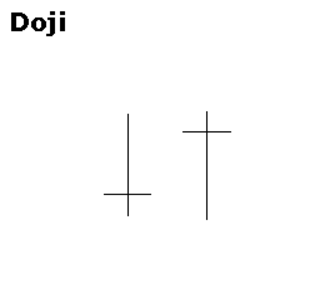 Doji form when a security's open and close are virtually equal. The length of the upper and lower shadows can vary and the resulting candlestick looks like a cross, inverted cross or plus sign. Alone, doji are neutral patterns. Any bullish or bearish bias is based on preceding price action and future confirmation. Doji convey a sense of indecision between buyers and sellers. Prices move above and below the opening level during the session, but close at or near the opening level. Neither bulls nor bears were able to gain control and a turning point could be developing. The relevance of a doji depends on the preceding trend or preceding candlesticks. After an advance, or long white candlestick, a doji signals that the buying pressure is starting to weaken. 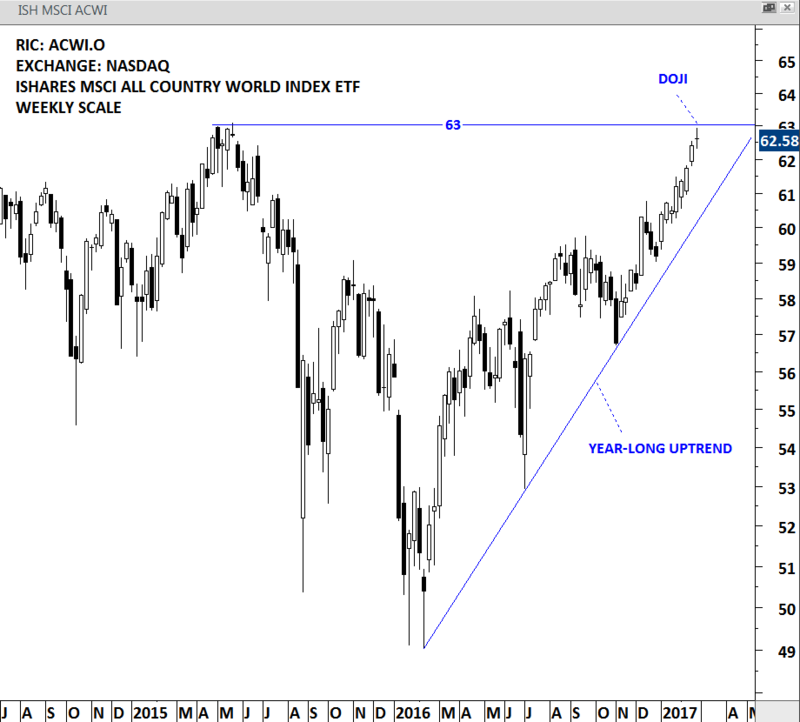 After a year-long uptrend ISHARES MSCI ALL COUNTRIES WORLD INDEX ETF (ACWI.O) reached its 2015 high levels that acted as resistance. This week's price action formed a Doji on the weekly scale chart. Given that the preceding trend was up and strong, this week's Doji clearly suggested that the buying power has stalled. Strong horizontal resistance stands at 63 levels. Global equities can experience a consolidation of the earlier gains and possibly a pullback towards the year-long upward trend line. Doji alone is not enough to forecast a reversal. Following week's price action around the strong resistance will provide valuable information. Energy prices are due for a strong directional movement after volatility reached extreme low levels. 2 month-long tight consolidation should end soon, possibly resulting in a sharp price movement. After breaking above 51.95 resistance, Brent Crude Oil entered in to a short-term sideways consolidation. Last 2 month's price action remained range bound between 52.50 and 56.10. 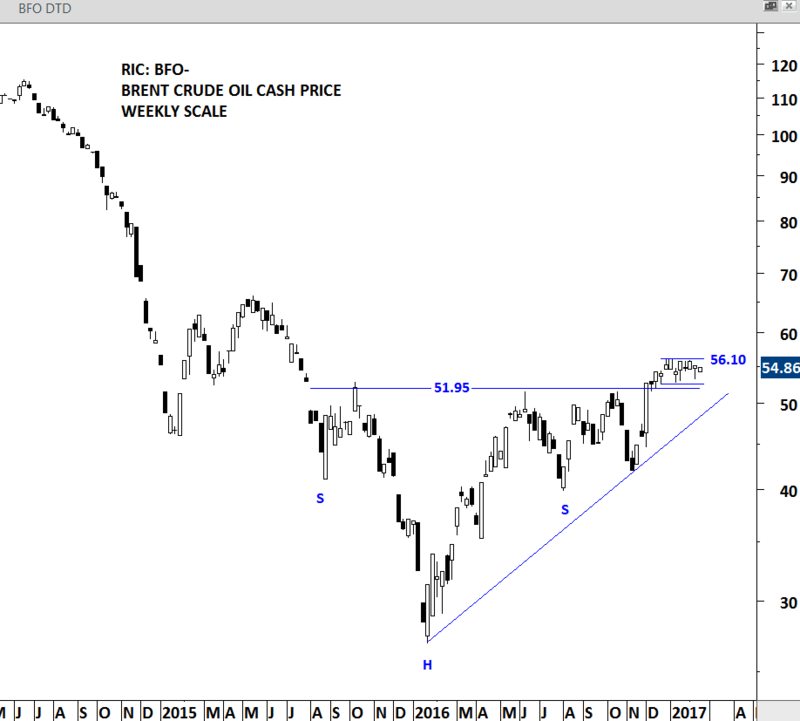 Breakout above 56.10 will add further momentum to Brent Crude oil prices that are already in a uptrend for the past year. Since the beginning of 2011, developed market equities have been performing better than emerging markets. This trend is still intact. Though there is one emerging European equity market that is showing clear strength against its peers. That is HUNGARY. 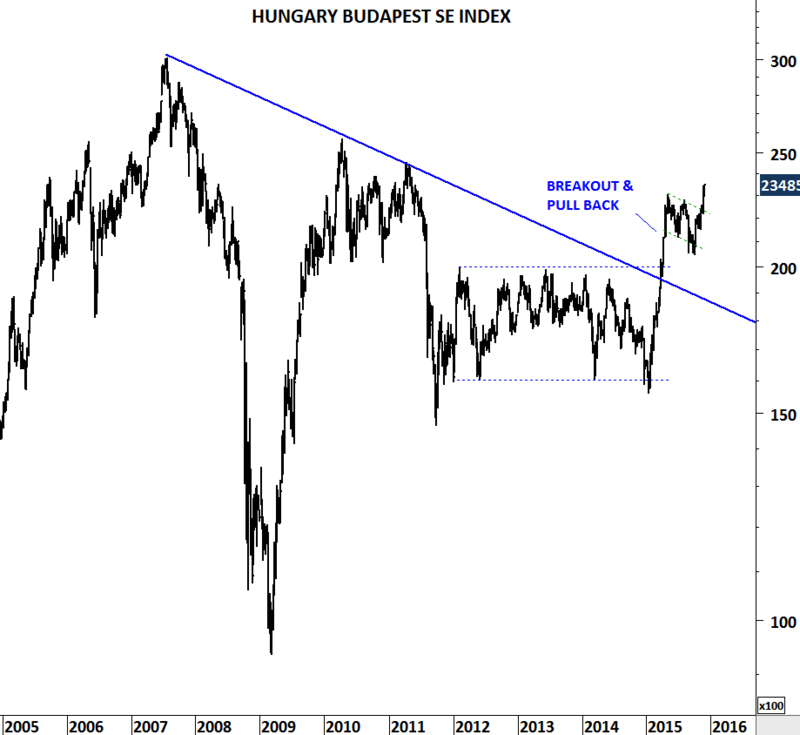 Budapest SE index is ready for another upward leg, after an initial breakout followed by a pullback. 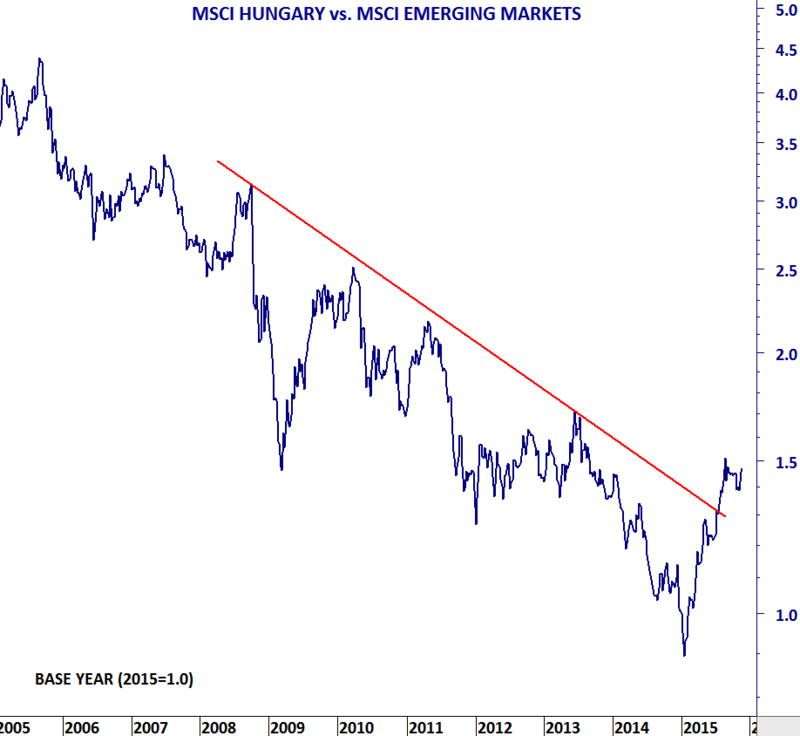 Since the beginning of the year MSCI Hungary has been outperforming MSCI emerging markets index. 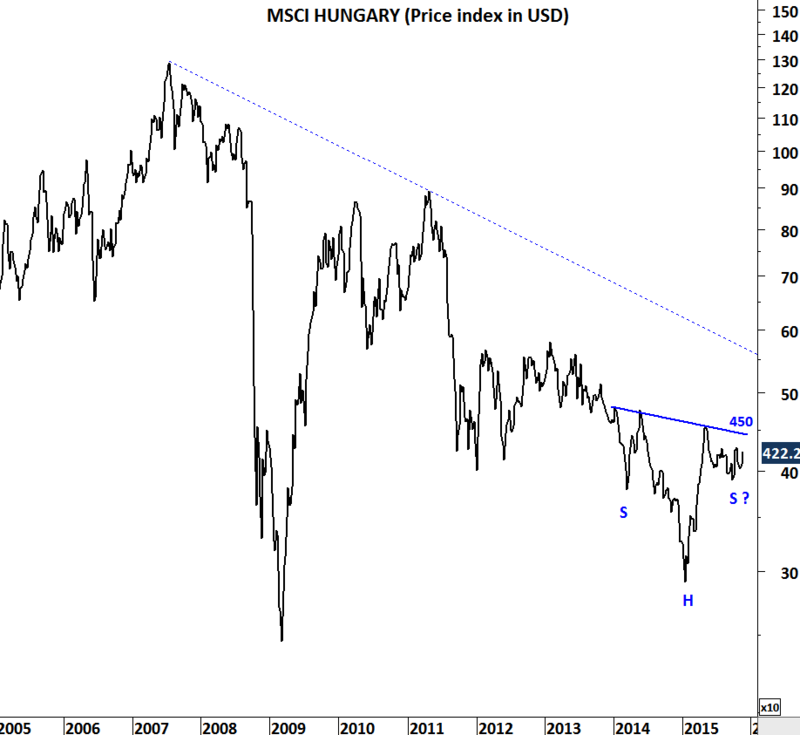 Also, a major reversal chart pattern; head and shoulder bottom, might be developing on the MSCI HUNGARY price index. These are bullish sign for the emerging European country. 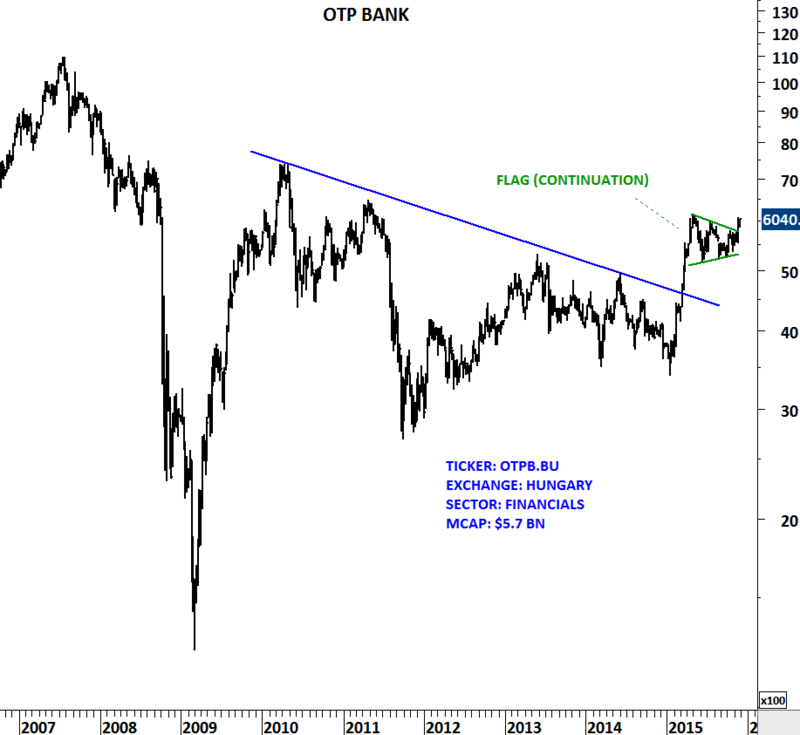 OTP BANK formed a flag (or symmetrical triangle) continuation chart pattern. 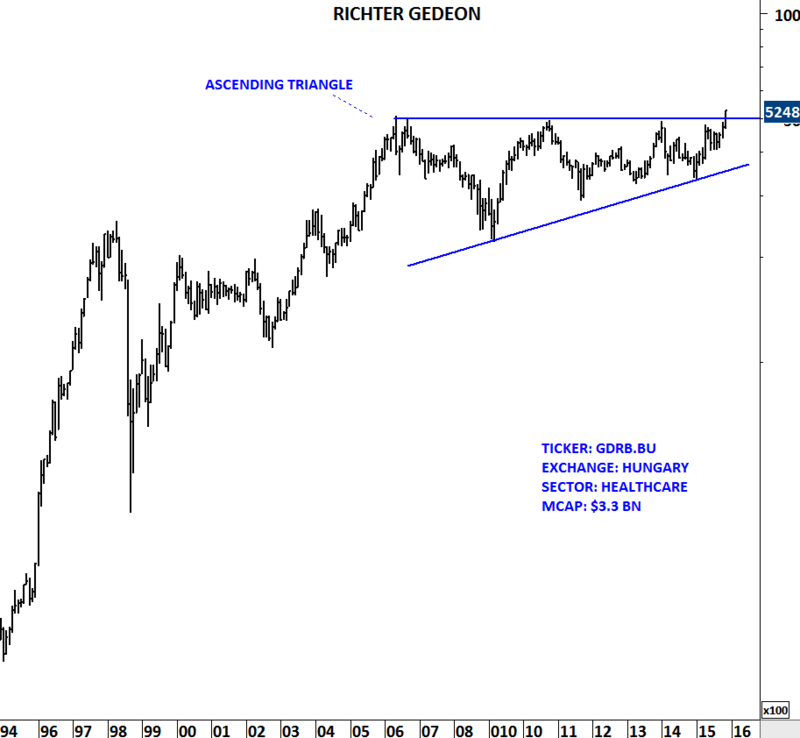 RICHTER GEDEON formed a massive bullish ascending triangle. Breakouts from these chart patterns should resume existing uptrends. 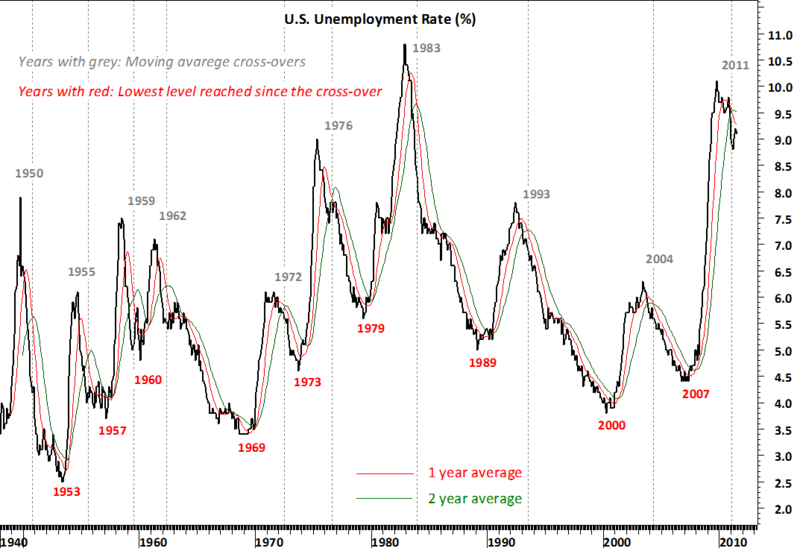 In this update I’m trying to understand and analyze the past behavior of the unemployment rate in the U.S. I’m using 1 & 2 year simple moving averages of the monthly data since 1948. The chart shows the years in grey color when moving averages crossed over (started a down trend in unemployment) and the years in red color when unemployment rate reached a low. Out of 9 cross-overs in the past six decade, 2 were short-lived and downtrend in unemployment rate reversed in the following year after the cross-over. These were during 1959-1960 and 1972-1973. After mild recoveries in the unemployment rate, economic outlook weakened and rate moved higher. However, of the remaining 7 cross-overs in the past six decade, unemployment continued to decline for a minimum of 2 years and maximum of 7 years. Latest cross-over occurred in the beginning of 2011. 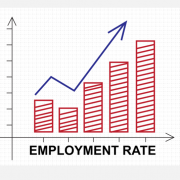 If history is a guide in the worst case unemployment rate can continue lower for another year until 2012. In the best case we are headed towards 6% levels in the next 3-7 years.